When it comes to gaming laptops, few companies worry about device bulk and heft, since powerful innards capable of rendering amazing graphics at blazing speeds are what really matters for the category. Gigabyte is joining Razer in trying to change that perception, however, with the new Aorus line of gaming devices announced during CES 2014. The new company's first PC is the 17.3-inch X7 gaming laptop: an aluminum clamshell that crams dual Nvidia graphics processors into a (comparatively) sleek 0.9-inch body that weighs in at 6.39 pounds. While the relative thinness of the X7 is great, 6.39 pounds is still way too heavy for the backpack set. 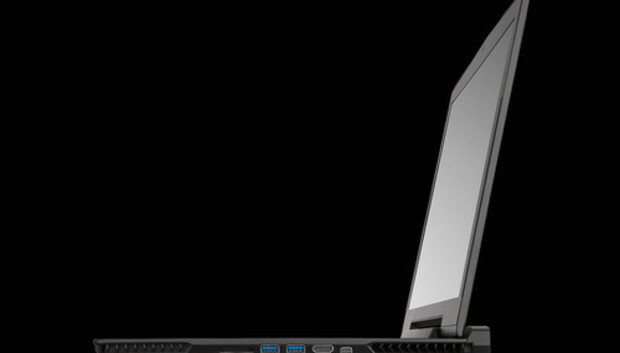 But when you consider Dell's Alienware 17 has a starting weight of 9 pounds, the X7 doesn't seem so bad. The X7 may be a lightweight when it comes to heft for a gaming laptop, but its insides prove to be quite capable. The device is rocking a quad-core 2.4GHz Intel "Haswell" Core i7-4700HQ and two Nvidia GeForce GTX 765M operating in unison with 4GB of total GDDR5 RAM dedicated to video alone. You also have your choice of 4GB or 8GB of system RAM, 128GB or 256GB of SSD storage, or a 1TB hard drive rated at 5400rpm. For ports you get 3 x USB 3.0, 2 x USB 2.0, 2x HDMI, mini-Display port, and an SD card reader. Networking includes LAN, 802.11AC Wi-Fi, and Bluetooth 4.0. For sound the laptop has two, two-watt speakers, and 2 subwoofers. There's also a 1.3 Megapixel webcam. Aorus advertises four OS choices, including Windows 8.1, 8.1 Pro, Windows 7 Home Premium, and Windows 7 Professional. It's not clear if those OS choices will be available in every country. With a gaming machine this thin, cooling is even more important than usual. The X7 uses 5 thermal pipes, 4 vents, and 2 fans as part of its "Thermal+" technology that increases air intake and exhaust, Aorus says. The X7 also has three customizable fan modes--auto, stealth, and turbo--for use under different system demands. For keyboard features, the X7 includes five programmable macro keys. Show offs can share their macros on the Aorus official form with just 1-click. There's also a "LockWin" key (yay!) to prevent an accidental system call from interrupting your gaming session. The X7 is expected to hit store shelves in the next few months with prices ranging from $2,100 to $2,800 depending on the configuration. You can find more info on the Aorus website.